First of all I would like to say congratulations to the ladies over at the Broke and the Bookish for reaching five years of Top Ten Tuesday! This weekly meme is so much fun and I feel like it really brings bloggers together, which is great, so well done on them for creating such a fun feature for all of us to do every week (and for coming up with so many great topics, I seriously have no idea how you guys do it!). Whilst I’ve been blogging for about a year and a half now (I can’t believe it’s been that long! 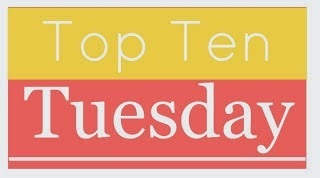 ), I only started participating in Top Ten Tuesday ten weeks ago, so I haven’t really been doing it long enough to decide on my Top Ten Favourite Top Ten Topics, I would just have to put the topics I’ve done so far, which would be really boring for you guys! So instead, I went through the list of old top ten topics and decided on a topic that I’d like to do for this week, which was top ten favourite fictional couples. Whilst I don’t really read straight up romances, I do like a little romance in the books I read, as long as it doesn’t overpower the main plot and there are definitely some fictional couples that I truly love, so without a further ado, these are my top ten favourite fictional couples. 1. Percy and Annabeth from PJO and HOO-You guys know how much I love these books, so it can hardly come as a surprise that Percabeth is top of my list of favourite fictional couples. I love them so much! They are so freaking adorable, I love the way their romance develops over the course of the first five books, it was a nice slow build up and it was worth the wait when they finally got together. I just think that they complement each other so well and I love how much they care about each other and how cute they are together. I just love them, they give me all the feels! 2. Connor and Risa from the Unwind Series-I know, I know, any excuse to shamelessly plug Neal Shusterman’s Unwind series but in all seriousness, I do love this couple. I think they really bring out the best in each other and I love how much they support each other and how adorable they are together. I also love how their relationship is developed over the course of the four books, in the background to everything else that is going on but still very much there. 3. Callum and Sephy from the Noughts and Crosses series-I was almost afraid to include these two in here, given the end of their love story, but couldn’t not include them. I maintain that their love story is one of the most beautiful yet heartbreaking things I have ever read. 4. Peeta and Katniss from The Hunger Games-My friend and I have argued about this, as she is a fan of Gale, whereas I prefer Peeta! I know a lot of people say that Katniss doesn’t truly love Peeta, not in the way that he loves her, maybe that’s true, but it’s clear to me by the end of Mockingjay that she cares for him deeply and I was always rooting for these two, hence why I included them in my list. The only thing I’m not too keen on with this couple is their ship name! 5. Ronan and Adam from The Raven Cycle-I didn’t ship these two originally, but their scenes together in Blue Lily, Lily Blue were filled with romantic tension and I thought they were really cute (cute is maybe the wrong word to use when discussing anything to do with Ronan but ah well) together, so I decided I would include them in this list as I am seriously hoping for some more Pynch scenes in the fourth book. 6. Rudy and Liesel from The Book Thief-Okay, so I know they were never technically a couple but man I love these two! Damn the ending of this book, it’s so sad! 7. Patridge and Lyda from the Pure Trilogy-I really liked these two, I thought they were really good together so I’m really sad that their story didn’t end in the way that I wanted it to. 8. Kat and Hale from Heist Society-These two are really cute together, I love their back and forth banter through the three books, it’s great and I always love it when characters are friends first and then build a relationship later. Plus it’s great to see them work together on their different cons. 9. Four and Tris from Divergent-These two have their problems, but at the end of the day, you know that they’re always there for each other and that’s what really counts. I liked the slow build of their relationship, and just think that they’re really cute together (when they’re not arguing). 10. Sherlock and Virginia from Young Sherlock Holmes-Damn these two! I was really rooting for them and they just couldn’t manage to get it together. I thought their relationship was really sweet, I loved the back and forth between the two of them (I find that banter between couples really makes me like them) and the fact that their friendship always came first, even though they both obviously liked each other. I kind of knew that it wasn’t going to work out between the two of them, having a vague knowledge of the original Conan Doyle stories, but a small part of me hoped that it would. Honourable Mention: Amy and Ty from Heartland, but I really include them because of the Canadian TV show as I like their relationship better in the TV show than the book, hence why they are an honourable mention rather than in the top ten. Are there any couples you would have added to my list? Do you agree with my list? Who are your favourite fictional couples? Let me know! Next week’s topic for Top Ten Tuesday is Top Ten Books You Have Read In 2015, but as I have only just started my tenth book of 2015 (life has got in the way of reading, damn it! ), I can’t really do that list. so I’ve decided to pick my top ten reads of 2014 instead, same topic, we’ll just change the year! I will have a new Wishlist Wednesday for you guys tomorrow, so make sure you look out for that! I thought so, there are so many great old top ten topics that I didn’t get the chance to do, that it seemed better to pick one of those rather than just list all the topics I’d done so far. Yes Percabeth are awesome, definitely my favourite fictional couple. I understand the struggle, so many books you want to read and you can’t get to them all! I hope you get to read the rest of HOO soon. Thank you! Love how you tweaked the prompt! Good job. Thanks! I was worried there wouldn’t be very many people like me this week, but I’m glad to see there are a few people who couldn’t do this week’s prompt either. It was a good topic choice! I might have to remember that one for future, I’ve been recommended a lot of books by friends before. I don’t know many of these couples, but I can mention Stephanie and Joe from the Staphanie Plum mysteries. They have known each other forever, and are always there in a crisis, but are sometimes off with other people. Isn’t it interesting how most of our fav couples come from series where we get to really know them as opposed to stand alones? Yes it is, I guess it’s because you have so much more time to develop a relationship in a series than you do in a stand-alone. Yes, they are awesome! Definitely my favourite fictional couple! I only know a few of these couples. I’ve yet to read the Percy Jackson series but my son really wants to read them so we’re going to tackle Lightning Thief together as a summer read. I love Katniss and Peeta and totally agree that they don’t have a very good ship name. I’ve yet to finish the last book in the Divergent trilogy but I think that Tris and Four make a good couple. Kaylee and Todd from the Soul Screamers series by Rachel Vincent are a good couple and Katy and Daemon from the Lux Series by Jennifer L. Armentrout are amazing! I hope you and your son enjoy Percy Jackson. Yes I do too, and agree that their ship name is rather unfortunate! Oh, I haven’t finished the last book in the Divergent Trilogy either, my choice of them is based off the first two books. I haven’t heard of those two couples, I’ll have to check those books out. I love your twist on this post and agree with you on some of these (the books you mentioned that I have read). I’m a Peeta fan over Gale, too. Thanks! Yeah me and my friend have endless arguments over that, she can’t understand why I like Peeta over Gale and I can’t understand why she likes Gale over Peeta! What a great list. Some good couples on here and I really like your ‘shameless’ plug of Shusterman. I love Unwind. Thanks! One of my main goals as a blogger is to get more people to read that series, I love it so much, so any excuse to promote it in a top ten list, I grab! I’ve read a few of these, but others are completely new to me like Unwind and Noughts & Crosses. I’ll have to go check those out! I hope you’re having an awesome week! Unwind and Noughts and Crosses are among my favourite books ever, I highly recommend both of them. I am, thank you. Love it when ever I come across another Percy Jackson Fan. Yay! Percabeth. Awesome list :-). I do too! Percabeth are the best. Thank you! Great list, so excited to see Rudy and Liesel included! I love them! The end always makes me so sad! I adore Peeta and Katniss! Me too! Thank you. No problem, thanks for stopping by mine! Thanks! Yeah they’re all favourites of mine too! Thanks! No problem, thanks for stopping by here!